The first sealing vessels from St. John's sailed to the ice in 1793. Following their successful expedition, the sailing seal fishery expanded rapidly. Soon after 1800 well over 100 schooners, carrying 3,500 to 4,000 men, were going to the ice each spring. Many of the original vessels had been used in the Bank fishery, traditionally the preserve of migratory English fishermen. But as the migratory fishery dwindled into insignificance and the inshore fishery expanded after the Anglo-French wars resumed in the 1790s, these vessels were put to use in the growing seasonal fishery on the French Treaty Shore and the Labrador coast. It made sense to employ them also in the spring seal fishery. Particularly in Conception Bay, the Labrador and seal fisheries became complementary, and these two great expeditions became mainstays of the economy of the southeastern part of the island. Building and fitting out boats became a major occupation - decked, schooner-rigged vessels of birch, juniper and pine with 40-50 ft keels and a 14-15 ft beam. The tonnage remained small, partly because of the belief that prevailed until the later 1820s that vessels over 100 tons would not be able to manoeuvre in the ice. It was not until the early 1850s that the average tonnage reached that figure. But as the tonnage rose, merchants tended to buy larger vessels from away rather than have them built locally, probably because of cost advantages. By 1857 almost all the vessels clearing from St. John's and Harbour Grace for the seal fishery were brigs and brigantines built mostly in the Maritime provinces. This development was a blow to local shipbuilders, but they continued to supply a significant number of smaller vessels. 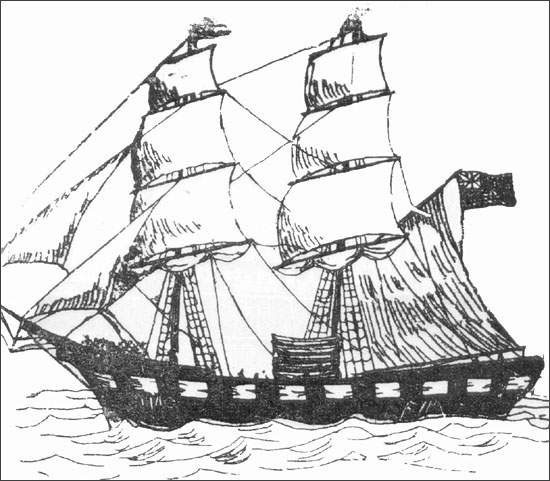 Brigs were a type of sailing vessel used in the seal fishery in the 1800s. From Michael Condon, The Fisheries and Resources of Newfoundland (St. John's, 1925) 35. So long as sealing was confined to sailing vessels based in outports as well as major centres, the industry created a significant distribution of wealth along the eastern coast. The sailing fleet reached a peak of nearly 400 vessels in the late 1850s, carrying nearly 14,000 men. This represents 11 percent of the island's total population, or an astonishing 45 percent of the male population aged between ten and 50 years, resident between Cape Race and St. John's. There can be no doubt that sealing made a major contribution to the outport economy, especially when one remembers the unrecorded landsmen of the northeast. In the early 1840s exports of seal products were valued at $1.7 million, representing about a quarter by value of the colony's total exports. In the 1850s the proportion was one third. Soon after Christmas, men who wanted to join a sealing voyage made arrangements with individual captains. In February clothes and boots were prepared, and at the end of the month the men congregated in the ports of departure, each man with his little bag of medicines - salves for cuts, friar's balsam for sprains and sulphate of zinc for ice-blindness - and the essential sealing equipment. This consisted of a gaff for killing young seals, a knife for pelting them, and a rope for hauling the pelts to the ship. The gaff was a sturdy pole, five to seven feet in length, tipped with an iron hook. It was used not only for killing pups, but also for balance on loose ice, for hauling oneself out of the water and shavings to start a fire. A few brought large guns with which to kill the older seals, which sealers filled with ten fingers of powder and shot of huge diameter. The recoil could knock a man down, and they were hard to lift. Essential sealing equipment included gaffs for killing the seals and rope for hauling them back to the ship. Courtesy of Archives and Special Collections (Coll - 137, 907-U), Queen Elizabeth II Library, Memorial University of Newfoundland, St. John's, NL. At first, vessels sailing to the ice left in April and hunted adult seals, like the northern landsmen. The departure date soon began to advance, and the principal quarry became the seal pups, or whitecoats, who were far easier to kill, and whose fat yielded high-quality oil. In the 1820s men went 'into collar' on March 1, and the vessels sailed about 17th. Twenty years later March 1 seems to have been the usual sailing date. The outfitting merchant provided all the provisions and various supplies for the voyage, for which the sealers had to pay berth money. This unpopular charge was never a standard amount, and could be as high as $10. The custom also grew up of sealers buying various articles from the merchant on credit against the proceeds of the voyage, a practice known as taking one's 'crop'. The catch was divided between owner and crew on a 50-50 basis, with the captain being paid on a separate basis. The usual first job for a crew was to cut the vessel out of the ice using saws, axes, ice chisels and gaffs, and coax it into open water. Then it was the skipper's task to find seals. Most Newfoundland vessels in the 19th century sailed to the Front, rather than the Gulf, which was a much smaller seal fishery in those days, exploited mainly by vessels from Halifax and the Magdalen Islands, and by landsmen. The aim of all skippers was to find the whelping patches, and take the whitecoats in their prime. To succeed demanded as much luck as good judgement. No matter how canny a skipper might be, no matter how skilful his reading of ice conditions, currents, winds and weather, he could still miss the 'main patch'. His vessel could easily be trapped by on-shore winds or barriers of heavy ice, or imprisoned motionless in the pack. It could be crushed against the shore, or between rafting ice pans. Unsuccessful voyages were by no means unusual. To avoid this disastrous outcome the captain would drive crew and ship as hard as he could, forcing it through the ice, constantly moving in search of the seals. A good patch of whitecoats was cause for great rejoicing. They were killed by a hard blow on the head with the gaff, and then 'sculped', that is, the skin and fat were cut away from the carcass. 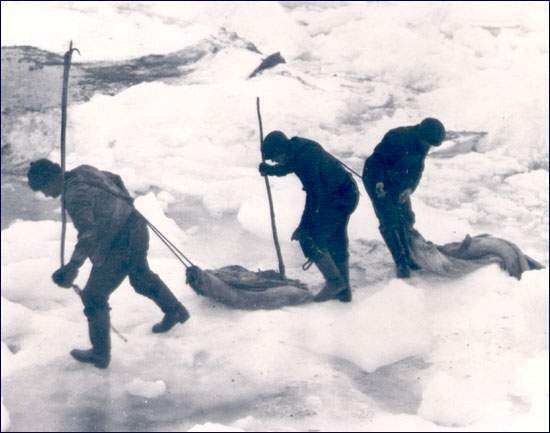 The 'sculps' were then towed back to the vessel, or piled on ice pans to be picked up later. Whitecoats on the Ice, n.d.
After the whitecoats were killed, they were sometimes piled on the ice and picked up later. The ship's flag was placed on the ice to mark the ownership of the pile. 907-W), Queen Elizabeth II Library, Memorial University of Newfoundland, St. John's, NL. If a schooner could not obtain a full load of whitecoats, which was quite usual, it would hunt the older seals. These were always shot, since they could not usually be tackled from close quarters, and in any case the skulls were too hard to be easily crushed with a gaff. Moreover, the adult seals were dispersed, which meant that there was little danger of injuring other sealers in the vicinity. 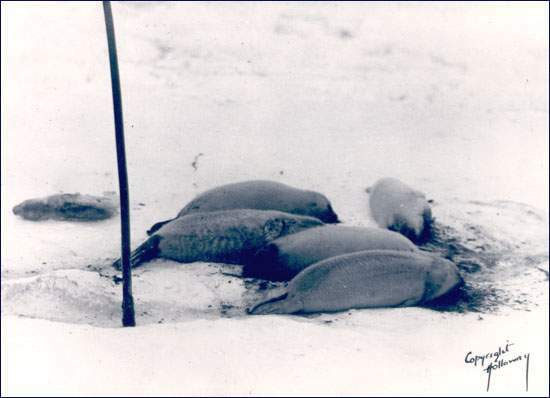 It has been argued that this operation did more damage to the herds than the whitecoat slaughter since many more seals were hit than retrieved, and the breeding stock was decimated. The voyage was usually over by the end of April. The return of the vessels was keenly anticipated. The people's interests, wrote the Rev. W. Wilson, were 'so interwoven with [the seal fishery], that its prosecution and results should cause more speculation, more anxiety, more excitement and solicitude than perhaps any other single branch of business in any part of the world' (Wilson 272). Some ships returned quietly, flags at half-mast to mark some disaster at the ice; some never returned at all; some returned with empty holes; and some sailed in proudly, log-loaded, crew cheering, a gun firing for every 100 pelts on board. A crew member might end up with $50 in his pocket, or still in debt to a merchant. The merchant in turn might lose his outlay, but he might equally triple it. In either case, the chance of significant gain was sufficiently good to make the effort worthwhile. But there is no doubt that the fishermen stood to gain far less than the merchant who found the risks acceptable given the high rate of return for a brief employment of men and capital. In the 1840s, the average value returned per ton of shipping employed was between $39 and $48 annually. At this rate, one successful voyage could wipe out several years' losses. In the 1850s the sailing seal fishery ran into difficulties. The value returned per ton employed declined by 44 percent between 1851 and 1860, and the records of Bowring Brothers, one of the more important St. John's firms, show that during the period 1853-58 the cost of outfitting exceeded the value of seals caught, with a crewman's share falling to $12.75. The reason was not the prevailing prices for seal products, which remained steady. The problem was the damage done to the seal herds over the previous 20 years. During the 1830s the harvest had averaged about 451,000 seals annually (not including the landsmen's catch), rising to 546,000 annually in the first half of the 1840s. The catch fell back to 376,000 in the late forties, a dramatic decline of 31 percent. The effect on the shipowners was to stimulate the acquisition of brigs and brigantines - the number of these rigs in the St. John's fleet increased from 235 in the 1840s to 342 in the 1850s - since it became clear that the advantage at the ice lay with large square riggers, and in the 1850s the annual catch rebounded to 437,000. But this was not sufficient: a more dramatic technological change was needed. The sealing merchants turned to steam.